What’s The Difference Between Natural/Organic Fertilizers and Synthetic Fertilizers? Most people head down to their local home and garden store when they are looking to purchase fertilizer for their yard. While having good intentions, many homeowners have no idea that they may be buying fertilizers that are actually harmful to their lawn, plants, kids and pets. Synthetic fertilizers contain mineral salts that are able to be dissolved in water. This means that when applied, the plants will absorb the synthetic fertilizer almost immediately. This is similar to giving a human a shot of steroids. In a similar way, the plants turn green quickly and look nice on the outside. While this may appear to be helping your lawn, the color will not last. Using synthetic fertilizers is a temporary fix. In a way, your lawn and plants will now be dependent on the synthetic fertilizer and you will need to reapply it regularly. Your soil has its own ecosystem. Soil naturally contains bacteria and fungi. Also, nematodes (microscopic worms), earthworms, animals, plants and other organisms live, eat, defecate, and die in the soil. When the soil ecosystem is healthy, plants will have all of the nutrition that they need. This is the natural relationship between soil and greenery. The problem with synthetic fertilizers is that they do not help feed the soil and over time they kill some of these micro organisms. Now the soil is missing some of the nutrients that the lawn and plants would normally be using as food. In essence, the soil slowly becomes less and less nutrient rich and the lawn and plants will begin to starve. Synthetic fertilizers are man-made, inorganic compounds. Quite often they are derived from by-products of the petroleum industry. When it rains these chemicals get carried into our neighborhood drains and pollute our environment. Many scientific studies have been done on synthetic lawn care products. Several of these studies have linked exposure to artificial lawn chemicals to an increased risk of cancer and other health problems in pets. In addition, children are much smaller than adults, are undergoing rapid physiological development and are located much lower to the ground. The lawn is also a place to play for many children. Because of this, they are at a much higher risk of suffering from the negative health consequences that synthetic fertilizers bring. On the other hand, natural and organic fertilizers act as both soil and plant food. You can think of them as “soil conditioners”. They contain live micro organisms and help to build up the organic matter in the soil naturally. Because of this, the soil will stay healthy and be able to provide the lawn and plants with the nutrients they need. This is very similar to how probiotics can help humans. 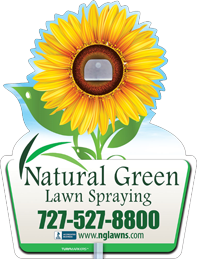 The lawn and plants can also absorb the natural and organic fertilizers as well. Once the soil’s ecosystem becomes balanced again the immune system of the grass and plants can function properly. The natural and organic fertilizers we use help to build up a net-like foundation in your soil so that it can hold nutrients and water better. Because there are no chemicals in these fertilizers you don’t need to worry about polluting the environment. This also means that they are safe for your children and pets. As we already discussed, animals, plants and other micro organisms eat, live, defecate and die in the soil which fertilizes it naturally. Organic fertilizer is usually made from these same exact components. Examples include plant and animal waste like manure, compost, bonemeal or cottonseed meal. This is the best way to make sure your soil and greenery thrive!